In analytical mechanics, specifically the study of the rigid body dynamics of multibody systems, the term generalized coordinates refers to the parameters that describe the configuration of the system relative to some reference configuration. These parameters must uniquely define the configuration of the system relative to the reference configuration. This is done assuming that this can be done with a single chart. The generalized velocities are the time derivatives of the generalized coordinates of the system. An example of a generalized coordinate is the angle that locates a point moving on a circle. The adjective "generalized" distinguishes these parameters from the traditional use of the term coordinate to refer to Cartesian coordinates: for example, describing the location of the point on the circle using x and y coordinates. Although there may be many choices for generalized coordinates for a physical system, parameters that are convenient are usually selected for the specification of the configuration of the system and which make the solution of its equations of motion easier. If these parameters are independent of one another, the number of independent generalized coordinates is defined by the number of degrees of freedom of the system. Generalized coordinates are paired with generalized momenta to provide canonical coordinates on phase space. One generalized coordinate (one degree of freedom) on paths in 2D. Only one generalized coordinate is needed to uniquely specify positions on the curve. In these examples, that variable is either arc length s or angle θ. Having both of the Cartesian coordinates (x, y) are unnecessary since either x or y is related to the other by the equations of the curves. They can also be parameterized by s or θ. Open curved path F(x, y) = 0. Multiple intersections of radius with path. Closed curved path C(x, y) = 0. Self-intersection of path. The arc length s along the curve is a legitimate generalized coordinate since the position is uniquely determined, but the angle θ is not since there are multiple positions for a single value of θ.
Generalized coordinates are usually selected to provide the minimum number of independent coordinates that define the configuration of a system, which simplifies the formulation of Lagrange's equations of motion. However, it can also occur that a useful set of generalized coordinates may be dependent, which means that they are related by one or more constraint equations. Two generalized coordinates, two degrees of freedom, on curved surfaces in 3d. Only two numbers (u, v) are needed to specify the points on the curve, one possibility is shown for each case. The full three Cartesian coordinates (x, y, z) are not necessary because any two determines the third according to the equations of the curves. which connects all the 3 spatial coordinates of that particle together, so they are not independent. The constraint may change with time, so time t will appear explicitly in the constraint equations. At any instant of time, any one coordinate will be determined from the other coordinates, e.g. if xk and zk are given, then so is yk. One constraint equation counts as one constraint. If there are C constraints, each has an equation, so there will be C constraint equations. There is not necessarily one constraint equation for each particle, and if there are no constraints on the system then there are no constraint equations. which is a point in the configuration space of the system. They are all independent of one other, and each is a function of time. Geometrically they can be lengths along straight lines, or arc lengths along curves, or angles; not necessarily Cartesian coordinates or other standard orthogonal coordinates. There is one for each degree of freedom, so the number of generalized coordinates equals the number of degrees of freedom, n. A degree of freedom corresponds to one quantity that changes the configuration of the system, for example the angle of a pendulum, or the arc length traversed by a bead along a wire. and the generalized coordinates can be thought of as parameters associated with the constraint. and so generally depends on the generalized velocities and coordinates. Since we are free to specify the initial values of the generalized coordinates and velocities separately, the generalized coordinates qj and velocities dqj/dt can be treated as independent variables. An example of such a constraint is a rolling wheel or knife-edge that constrains the direction of the velocity vector. Non-holonomic constraints can also involve next-order derivatives such as generalized accelerations. which illustrates the kinetic energy is in general a function of the generalized velocities, coordinates, and time if the constraints also vary with time, so T = T(q, dq/dt, t). In the case the constraints on the particles are time-independent, then all partial derivatives with respect to time are zero, and the kinetic energy is a homogeneous function of degree 2 in the generalized velocities. and dividing by the square differential in time, dt2, to obtain the velocity squared of particle k. Thus for time-independent constraints it is sufficient to know the line element to quickly obtain the kinetic energy of particles and hence the Lagrangian. Bead constrained to move on a frictionless wire. The wire exerts a reaction force C on the bead to keep it on the wire. The non-constraint force N in this case is gravity. Notice the initial position of the wire can lead to different motions. For a bead sliding on a frictionless wire subject only to gravity in 2d space, the constraint on the bead can be stated in the form f(r) = 0, where the position of the bead can be written r = (x(s), y(s)), in which s is a parameter, the arc length s along the curve from some point on the wire. This is a suitable choice of generalized coordinate for the system. Only one coordinate is needed instead of two, because the position of the bead can be parameterized by one number, s, and the constraint equation connects the two coordinates x and y; either one is determined from the other. The constraint force is the reaction force the wire exerts on the bead to keep it on the wire, and the non-constraint applied force is gravity acting on the bead. which now both depend on time t due to the changing coordinates as the wire changes its shape. Notice time appears implicitly via the coordinates and explicitly in the constraint equations. Simple pendulum. Since the rod is rigid, the position of the bob is constrained according to the equation f(x, y) = 0, the constraint force C is the tension in the rod. Again the non-constraint force N in this case is gravity. Dynamic model of a simple pendulum. The relationship between the use of generalized coordinates and Cartesian coordinates to characterize the movement of a mechanical system can be illustrated by considering the constrained dynamics of a simple pendulum. The use of θ to define the configuration of this system avoids the constraint provided by the equation of the circle. where g is the acceleration of gravity. in the three unknowns, x, y and λ. This formulation yields one equation because there is a single parameter and no constraint equation. This shows that the parameter θ is a generalized coordinate that can be used in the same way as the Cartesian coordinates x and y to analyze the pendulum. The formulation of Lagrange's equations for this system yields six equations in the four Cartesian coordinates xi, yi i=1, 2 and the two Lagrange multipliers λi, i=1, 2 that arise from the two constraint equations. The use of the generalized coordinates θi i=1, 2 provides an alternative to the Cartesian formulation of the dynamics of the double pendulum. 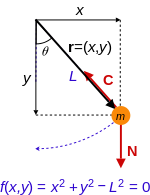 Spherical pendulum: angles and velocities. in which (θ, φ) are the spherical polar angles because the bob moves in the surface of a sphere. The position r is measured along the suspension point to the bob, here treated as a point particle. A logical choice of generalized coordinates to describe the motion are the angles (θ, φ). Only two coordinates are needed instead of three, because the position of the bob can be parameterized by two numbers, and the constraint equation connects the three coordinates x, y, z so any one of them is determined from the other two. The principle of virtual work states that if a system is in static equilibrium, the virtual work of the applied forces is zero for all virtual movements of the system from this state, that is, δW=0 for any variation δr. When formulated in terms of generalized coordinates, this is equivalent to the requirement that the generalized forces for any virtual displacement are zero, that is Fi=0. where δrj, j=1, ..., m denote the virtual displacements of each point in the body. where vj is the velocity of the point of application of the force Fj. ^ Some authors set the constraint equations to a constant for convenience with some constraint equations (e.g. pendulums), others set it to zero. It makes no difference because the constant can be subtracted to give zero on one side of the equation. Also, in Lagrange's equations of the first kind, only the derivatives are needed. ^ Some authors e.g. Hand & Finch take the form of the position vector for particle k, as shown here, as the condition for the constraint on that particle to be holonomic. ^ Farid M. L. Amirouche (2006). "§2.4: Generalized coordinates". Fundamentals of multibody dynamics: theory and applications. Springer. p. 46. ISBN 0-8176-4236-6. ^ Florian Scheck (2010). "§5.1 Manifolds of generalized coordinates". Mechanics: From Newton's Laws to Deterministic Chaos (5th ed.). Springer. p. 286. ISBN 3-642-05369-6. ^ Greenwood, Donald T. (1987). Principles of Dynamics (2nd ed.). Prentice Hall. ISBN 0-13-709981-9. ^ Richard Fitzpatrick, Newtonian Dynamics, http://farside.ph.utexas.edu/teaching/336k/Newton/Newtonhtml.html. ^ Torby, Bruce (1984). "Energy Methods". Advanced Dynamics for Engineers. HRW Series in Mechanical Engineering. United States of America: CBS College Publishing. ISBN 0-03-063366-4. Ginsberg, Jerry H. (2008). Engineering dynamics (3rd ed.). Cambridge UK: Cambridge University Press. ISBN 978-0-521-88303-0. Kibble, T.W.B; Berkshire, F.H. (2004). Classical Mechanics (5th ed.). River Edge NJ: Imperial College Press. ISBN 1860944248. This page was last edited on 23 April 2019, at 14:56 (UTC).